A new biologically-inspired, flapping-wing RoboBee that can fly, dive into water, swim, propel itself back out of water, and safely land on the surface has been brought to life by researchers at the Wyss Institute for Biologically Inspired Engineering at Harvard University and the Harvard John A. Paulson School of Engineering and Applied Sciences (SEAS). The team had earlier developed a miniature first of its kind robot that could fly in the air and swim inside water. 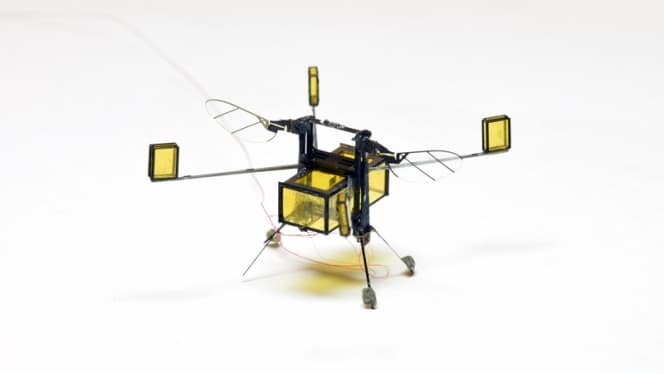 Back then in 2015 the team was working on the challenge to create necessary lift to take the RoboBee from water back to the air in the form of larger aerial-aquatic robots. The dream seems to have been accomplished with this new microrobot capable of repeatedly moving in and through complex environments. The development however had been fraught with numerous challenges which the scientists had to overcome. First, water being 1,000 times denser than air, the robot’s wing flapping speed was likely to vary widely between the two mediums. If the flapping frequency was too low, the RoboBee wouldn't have been able to fly. If too high, the wings would have snapped off in the water. The team used Goldilocks combination of wing size and flapping rate, scaling the design to allow the bee to operate repeatedly in both air and water. Using this multimodal locomotive strategy, the robot was made to flap its wings at 220 to 300 hertz in air and 9 to 13 hertz in water. Further the impact and sharp edges could break the surface tension of water to facilitate the RoboBee’s entry, but the question of getting it out back again remained. To tackle this situation, the researchers retrofitted the RoboBee with four buoyant robotic floaties and a central gas collection chamber. So once the RoboBee swam to the surface, an electrolytic plate in the chamber converted water into oxyhydrogen, a combustible gas fuel. The gas increased the robot’s buoyancy, pushing the wings out of the water, and the floaties stabilized the RoboBee on the water’s surface. From there, a tiny, novel sparker inside the chamber ignited the gas, propelling the RoboBee out of the water. The robot was designed in such a way that it passively stabilized in air, to always lands on its feet. However because of the lack of onboard sensors and limitations in the current motion-tracking system, the RoboBee cannot yet fly immediately upon propulsion out of water but the team hopes to change that in future research. We designed new mechanisms that allow the vehicle to directly transition from water to air, something that is beyond what nature can achieve in the insect world, quoted Yufeng Chen, Ph.D., currently a Postdoctoral Fellow at the Wyss Institute who was a graduate student in the Microrobotics Lab at SEAS when the research was conducted and is the first author of the paper. The team hopes that the Hybrid robot would perform search and rescue missions, research studies and environmental monitoring effectively in near future. The paper regarding the findings was published in Science Robotics.